Want to tell the world about your Second Life land, parcel or region? Now you can with Place Pages, which are Linden-hosted web pages that make it easier than ever to promote and discover your presence in Second Life. To visit a place page, simply click a Place Page URL in the page you’re viewing or paste it into your web browser's address bar. You may also search for a Place Page using the Google search engine by entering your search terms into the Google search bar on the Place Pages front page. While viewing a Place Page, you may learn more about the location, view images and videos, or ultimately visit the location in Second Life by clicking the Visit this location button located on the large image at the top of the page. Note: Upon visiting a place from a Place Page, you appear at either the parcel's landing point or the region's telehub, depending upon whether the Place Page depicts a parcel or a region. If no telehub is set for the region, you appear at the center of the region. Region owners and Estate Managers always appear at the center of their own regions. Visit This Location - Click this button to visit the location depicted in the Place Page. Share It - Click to share this place page on Facebook or Twitter. Region Information - Lists information about the Region if this is a Region Place Page, including Name, Owner, Type, Size, and Maturity. Parcel Information - Lists information about the Parcel if this is a Parcel Place Page, including Name, Owner, Type, Size, Maturity, Category, and Region. Report Abuse - Click to file an abuse report against the Place Page. This may be appropriate if the Place Page: is not marked as Mature or Adult content when appropriate, is spam, or infringes your intellectual property rights. View Covenant (optional) - View the Region's covenant in a pop-up frame. This link is available on both Region and Parcel place pages. Upcoming Events (optional) - View and filter a calendar of upcoming events on this land. Click event names to get more details about each event. Items for Sale (optional) - View items currently for sale on the parcel. Click Go next to an item to teleport directly to the item inworld. FOR SALE (optional) - Appears if the land is currently for sale, and lists the sale price. By default, every parcel and region in the Second Life world has a Place Page that is automatically derived from information in the parcel's existing profile. 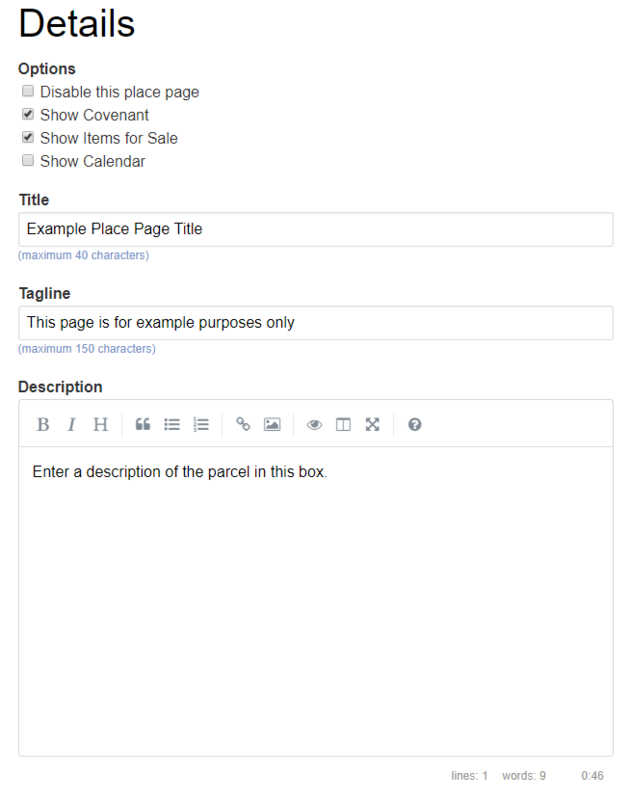 You may edit and embellish a Place Page for any parcel or region you own, or for group-owned parcels for which you have the Toggle 'Show Place in Search' and set category group ability. However, nobody can visit a Place Page unless the parcel's Show Place in Search checkbox is checked in the About Land window. Please note that this is toggled “off” by default, so you’ll need to enable it. Visit the place pages dashboard at: https://places.secondlife.com and log in using your Second Life credentials. In the upper right of the dashboard, move the mouse over your name and select My Places from the dropdown to view a full list of parcels and regions you own. Choose a region or parcel and click the Edit link next to that land's listing to begin editing the Place Page for that land. Disable this place page - Disables the Place Page so nobody can view it. Show Covenant - Select this box to allow visitors to view the Region's Covenant on your Place Page. Show Items for Sale - Select this box to show items for sale on the parcel, and the inworld location of those items. Sale items may take up to 24 hours to appear on your Place Page. Each sale item must be set to Show in search on the General tab of the object editor window. Items set to Show in search that are not for sale still appear in the list, but are moved to the end of the list and have a cost listed as "Not Available". Show Calendar - Displays an event calendar and a list of upcoming events for the parcel. Visitors can filter events by specific date and click the event's name to learn more about the event. If there are no upcoming events, the calendar and event list are not shown. Title - The title for the Place Page. Typically, this is the name of your land. Tagline - A short, descriptive subtitle, displayed prominently on the "hero" banner at the top of the page. Description - A longer description or profile for the location, displayed below the images on the Place Page. 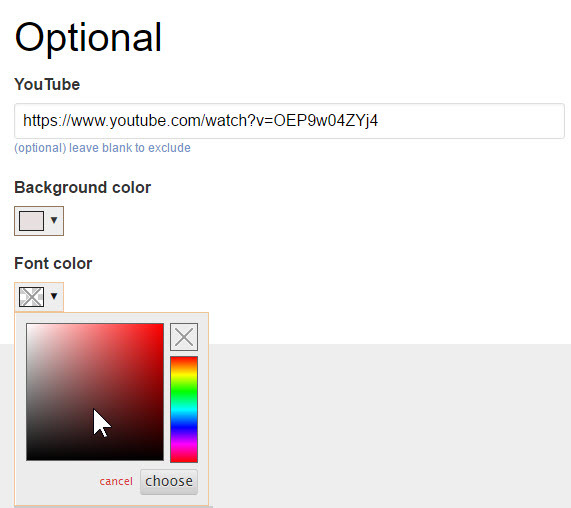 Under the Optional section, you may provide a YouTube link in order to display a video on your Place Page. The Optional section also provides options for you to customize the color of your Place Page's background and font. Under the Hero Image section, choose an image to be the background of the banner at the top of your Place Page. 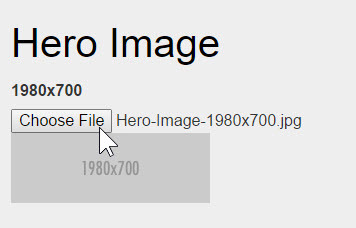 Hero images must be 1980x700 resolution, or else they may be subject to distortion. Under Additional Images, you may choose up to three additional images to display on your Place Page. The images are shown as a slideshow and periodically cycle if not clicked by a user. Additional images must be of 852x486 resolution or they may be subject to distortion. 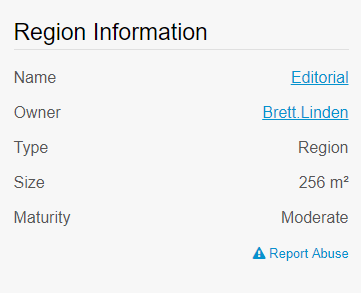 The Region Information section provides statistical information about the land, and cannot be edited in the Place Page Editor. A landing point is the spot where visitors appear when they teleport to a parcel of land, including teleports that are initiated by clicking the Visit this location button on a place page. Landing points can enhance your visitors' experience by directing them to an appropriate starting location on your land. 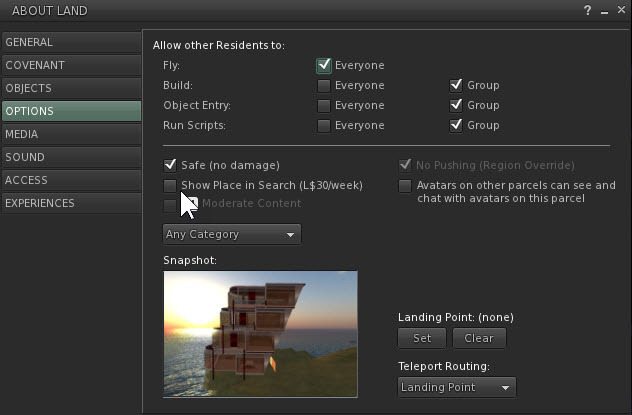 Because landing points are a property of parcels and are not specific to Place Pages, they can only be set from within the Second Life Viewer and cannot be changed in Place Pages settings. For instructions on how to set the landing point on land that you own, see Managing your parcel - Setting a landing point. Note: When visiting a region's Place Page, visitors appear at the region's telehub. If no telehub is set, they appear at the center of the region. Region owners and Estate Managers always appear at the center of the region, regardless of whether a telehub is set. 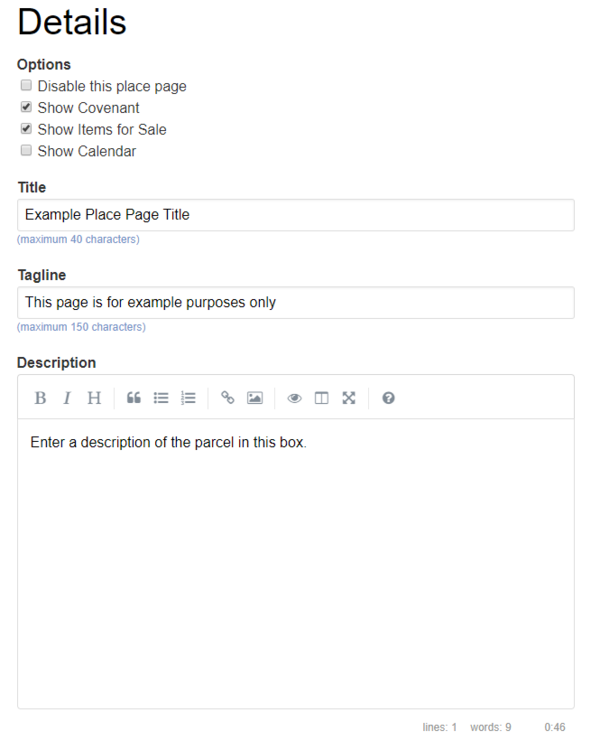 Place Pages for land parcels are not visible to other Residents unless the land's Show Place in Search checkbox is checked in the About Land window. This box is unchecked by default. You may access the About Land window by visiting the parcel, then choosing World > About land from the top menu bar. 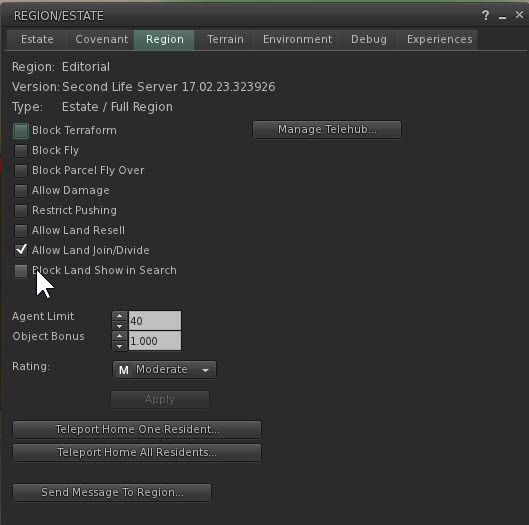 If you wish to hide an entire region's Place Page (and Place Pages for all parcels on the region), you may check the Block Land Show in Search checkbox in the Region tab of the Region/Estate window. You may access the Region/Estate window by visiting the region and choosing World > Region/Estate from the top menu bar. Note: The 360 snapshot feature is still in a very experimental Project Viewer stage, and is subject to drastic change or removal at any time as development continues. Capture a 360 snapshot to your computer as described in Taking inworld snapshots. Go to https://places.secondlife.com/spherical_zips in your web browser. You must be logged into the Second Life website in order to complete this step. Click the New button, then click Choose File and select the captured 360 snapshot (ending in ".zip") from your computer. 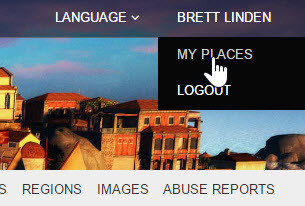 Choose one of your places from the Place dropdown. 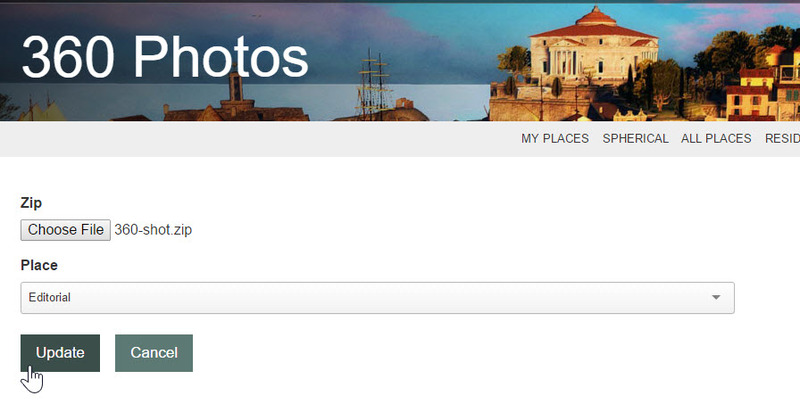 Press the Update button to upload your 360 snapshot to the selected Place Page. An uploaded 360 snapshot replaces the Hero Image for the selected Place Page, allowing visitors to pan around the image for a full 360 degree view of the place where the image was captured. At the very bottom of the Place Page editor is a Last Updated by field that indicates when the page was last edited, and by whom. This can be of use to groups in which multiple officers may have the ability to edit Place Pages for the group's land. Click My Places to open a list of your Place Pages. Scroll to the bottom of the page and click the link for Bulk Enable/Disable. On the Bulk Enable/Disable page, you can use the radio buttons in the Edit Status column to Enable or Disable each eligible Place Page. You may use the Enable All or Disable All button to automatically mark all pages accordingly. These changes are not finalized until you click the Update button at the bottom of the page. Click Update to enable and/or disable the marked Place Pages. You are then returned to My Places. You may also use the Search field to look for a specific parcel or set of parcels.